Kimberly's professional experience combines more than thirty years of work in the interior architecture and design industries. Her award-winning design work integrates architecture, function and interior design. She works with homeowners to translate their dreams into interior works of art built to house legacies. A gifted listener and innovative spirit Kimberly walks her clients through each step of the design process including dialing in the right custom cabinetry and handpicked furnishings to create functional living spaces. Equipped with first-rate experience in custom cabinet design, interior architecture, millwork, perspective renderings and home furnishings, Kimberly offers a comprehensive perspective that delivers. She knows how to effectively represent clients on all aspects of the project. For twelve years Kimberly operated a successful design firm based in Lansing, Michigan. She then carved out a career in Charlotte, North Carolina to meet the needs of a new and expanding client base. Today, her Charlotte-based interior design firm, KBN Interiors, is thriving! She continues to build a timeless portfolio of elegant residential work. Now a force in the Charlotte, North Carolina design community, Kimberly paved the way for KBN Interiors to receive honors such as the 3rd place Regional Sub-Zero Kitchen Design Award and the "Best at the Lake" remodeling award. Furthermore, her extraordinary work dots the map across the country and abroad with concentrations in Michigan and North Carolina. Kimberly was born and raised in Michigan where she graduated from Michigan State University with a degree in interior design. She went on to study architecture at the University of London and the Institute for Classical Architecture in New York City. She resides in Charlotte, North Carolina with her husband Rob, their two dogs and rabbit. Free time at their cozy farm in Harbor Springs, Michigan is spent setting out on their standup paddle boards or in their kayaks—the perfect way to soak up a northern Michigan day! Drawing out a client's creative vision comes naturally to interior designer Laura Barrick Floyd who thrives on listening. She works with clients to create interiors that uniquely reflect the interesting layers of their personalities, which come to life in all the fine details. Originally from Cincinnati, Ohio, Laura's knack for design was cultivated at a young age in a family whose professions were based in the commercial and residential construction industries. Thanks to a recommendation from her father, who did business in Charlotte, she went on to attend University of North Carolina at Charlotte. At UNC, her lifelong passion for art and design began to take shape as a profession. Her design career began while working for a tile and stone showroom. Laura went on to work for Tile Collection, where she designed kitchens and baths—working with a full-scale remodel crew that managed the execution of her designs. This led to a position with New Old, a custom homebuilder, where she was the design project manager. Laura stays up to date on current trends and vendors in the design world by being involved. She's an NKBA member and served as president of the Interior Design Society. She's actively involved with Habitat for Humanity, and she attends industry conferences and markets that keep interior design ever evolving. Hiking, being outdoors, and digging into books are a few of Laura's loves. She also relishes time spent with family and friends, and participating in the local art culture. She thrives on new challenges, and finds that the more she learns about the world of design, the better her ability to work in different vernaculars and with clients of unique backgrounds. 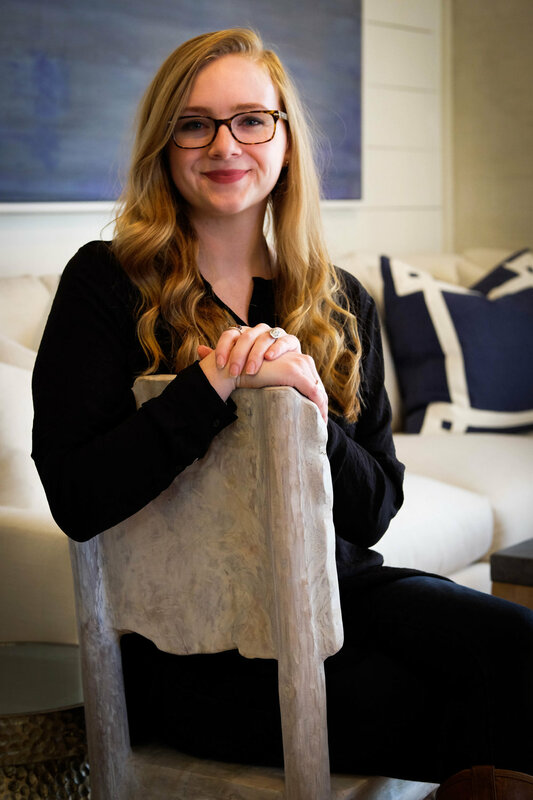 It was through numerous awards and recognition that Kimberly Brewer Nawn found the talented interior designer Stephanie Pettit, and immediately recruited her. Pettit joined the KBN team in 2014. Today she works closely beside Kimberly on the architecture and construction selections team. Kitchen, bath and cabinet design are a few of her specialties. Additionally, Stephanie is an accomplished architectural technology draftsperson and manages all of KBN's 3D drawing production. Pettit arrived at KBN Interiors equipped with a bachelor's of art degree in interior design from the Art Institute of Charlotte. Today she's a rising star in the Charlotte design community! When she's not working, Stephanie pursues her lifelong passion for gymnastics and the arts. She and her family live in Denver, North Carolina with their dog, Tucker. They frequent Hilton Head Island to visit family, and it's no secret that they're big fans of Disney World! Alix Brewer is a savvy professional. She enjoys working in the dynamic atmosphere of KBN Interiors. She welcomes clients, and sees to the preliminary introductions to the KBN design team. Alix excels at managing the project details, expertly coordinating the materials necessary for the development process. Backed by a degree in business management from Appalachian State University in Boone, North Carolina, Alix is an integral part of the KBN office where she assists with selections and staging, and tracks purchase orders. Alix's love of travel, culture and community speaks to her passion for working with a diversity of clients. When she’s not overseeing the KBN office, you can find Alix in the great outdoors—hiking and soaking up nature. She loves the fall in the Blue Ridge Parkway, Boone's thriving art community, yoga and bluegrass music. When summer unfolds, she heads to her family farm in Harbor Springs, Michigan where she revels in the small town lifestyle and beautiful Lake Michigan.